Informed parenting with confidence means not allowing the fear mongering to dictate your parenting choices. I have gathered up all the valuable information I have found through various reliable sources such as the AAP & KellyMom , and listed the important information you should know and answered some of the common questions that normally come up at Breastfeeding mama talk regarding the consumption of alcoholic beverages while breastfeeding. *Can I drink alcohol while breastfeeding? Yes you can, this is a question that comes up a lot at Breastfeeding mama talk. And the answer is YES you can, but of course there are some exceptions. The general rule is If you are sober enough to drive then you are sober enough to nurse. The American Academy of Pediatrics (AAP) states that nursing mothers can have an occasional alcoholic drink—the equivalent of a 12-ounce beer, 4-ounce glass of wine, or 1 ounce of hard liquor – but that mom should wait at least two hours per drink before breastfeeding. Alcohol peaks in mommy's blood and milk at about ½ to an hour upon first drink, but of course that can vary from person to person, depending on weight, how much food was eaten in the same time period, body fat, ect... Just like how alcohol leaves your blood stream it will also leave your milk and will not accumulate in the milk. In my personal opinion I would say if this is something you're worried about wait at least 2 hours or so after you had your first drink, to nurse. *Should I pump & dump after drinking an alcoholic beverage? There is no need to pump & dump milk after drinking alcohol, other than for mom’s comfort— pumping & dumping does not speed the elimination of alcohol from the milk. Alcohol doesn't accumulate in your milk. Just like it leaves your blood system it will leave your milk. So the pump and dump theory is just an old wives tale and a waste of time, energy, and valuable milk. *No need to pump and dump your milk. The alcohol will pass through your milk just as it does your blood stream. Pumping and dumping would be for the comfort of the nursing mom only. Pumped milk that contains alcohol is permanent and will not leave your milk as it would if it was still in your body. *One drink would be: 12 oz of 5% beer, or 5 oz of 11% wine, or 1.5 oz of 40% liquor (80 proof). *The peak level in milk is likely to occur about 1 hour after consumption. *Alcohol does not increase milk production. In fact, babies nurse more frequently, but take in less milk in the 3-4 hours after mom has had a drink, and one study showed a 23% decrease in milk volume with one drink (Mennella & Beauchamp 1991, 1993; Mennella 1997, 1999). ~In summary based on all the information I have gathered is, go out enjoy a drink or two, and it shouldn't be a problem. Most mothers I have talked to say they usually go out at night after they have already put the kids down for the night, so by the next feeding, 6-8 hours had already passed. Always listen to your gut though. Mothers intuition is sometimes better than anything out there. If you are not feeling good about something you consumed and are that worried , then worse case scenario you give baby some frozen milk that I'm sure you have stored in your freezer and wait until the next day to nurse. 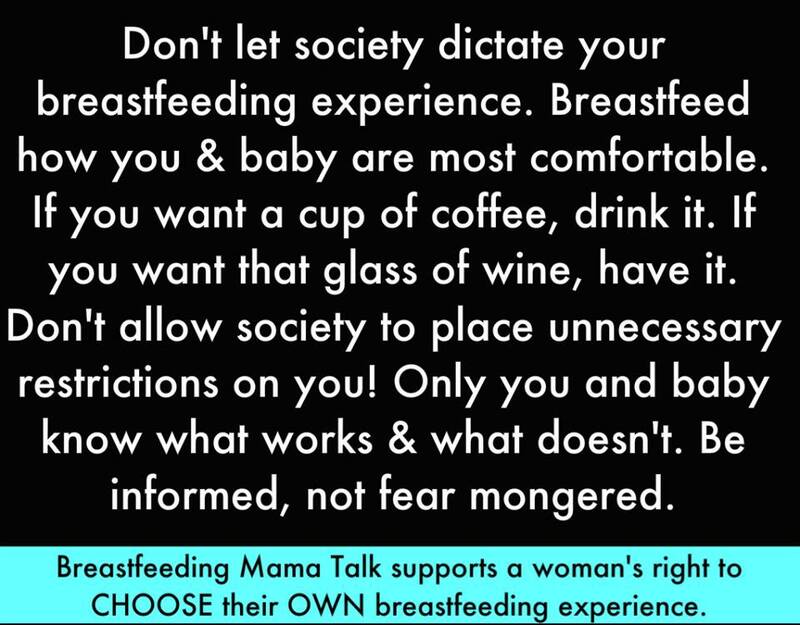 Just because you are breastfeeding doesn't mean you have to be restricted in other areas of your life. I always hear people trying to compare nursing with pregnancy and the two couldn't be any more different. When you're pregnant, of course, everything you consume goes directly to baby, but with nursing and alcohol there are ways around things you consume going to baby. Remember, you're a nursing mother, but you CONTROL your own nursing experience, not the other way around.